than the skin tone to create the perfect Halloween pale complexion. 2. Take it a shade paler with the white highlighter shade from the Aubergine Eye Shadow Trio. bringing it down to the jaw line. desired intensity. Try the Oval Shadow Brush for this step! Liquid Eye Definer), make small dots around the outside of the blue shadow. 5. Deepen the lashes with Volumizing or Curling Mascara. desired design on your chin with the liner and then fill in with Sassy Lip Stick. 8. 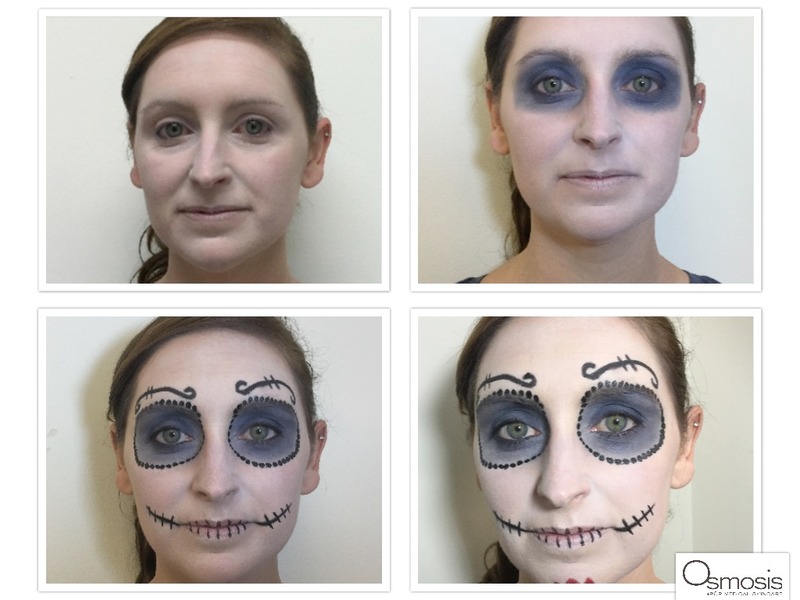 Finish off the look using the Liquid Eye Definer to create your perfect Day of the Dead look. Designs on the forehead and jaw line are popular and accessible areas to flaunt your creativity! Don't forget your Melt Away Gelee at the end of the night for easy and fast removal!